Enis has a wealth of experience from running his own company Westend AV, which offers audio and visual solutions for venues, bars, events, restaurants and more. He enrolled on the IOA Diploma in Acoustics and Noise Control with the hope of gaining new skills that would help him expand his business. In the past Enis has found himself hiring acoustic consultants on several projects to improve the service he offered and to make sure that the systems he installed were within UK legislation. He realised that this was an area he could build his own knowledge in, and would be able to provide more complete solutions without the need for external expertise. "This course means I can improve my own skills, so I can manage more jobs myself," he explains. It allows me to improve the service I offer to clients, and become more professionally recognised for offering acoustics and noise consultancy. Hopefully I will be able to take on more projects and expand my business this way. 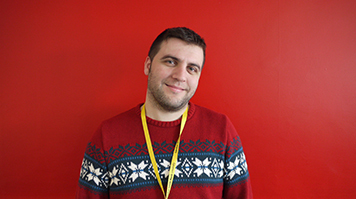 "I live in London so LSBU was the obvious choice to do the Diploma," Enis says. "It's the only provider in London with this level of facilities – the labs, and the anechoic and reverberation chambers." LSBU's reputation was a factor, too. "I think LSBU is well-known for its engineering and architecture courses, and these fields are closely related to acoustics." The course runs one full day a week so Enis has been able to continue to work part-time. He says it has been hard work as there is a lot of reading – maths and physics, and acoustics theory, but he's found the tutors helpful and friendly, and has enjoyed the international and cosmopolitan nature of LSBU's student body. "It's worth the hard work," he says. "The additional theory I'm learning means additional services I can offer. The course is opening my eyes to hidden areas of my industry, and I feel I'm developing as a professional."